POSSIBLE first-round draft prospect Cameron Rayner starred in wet conditions with a best-on-ground display in the NAB AFL Academy’s 20th anniversary match at the MCG. Select Level One and Level Two academy players were selected for the game, named after two graduates of the AFL Academy in Joe Daniher and Jacob Weitering. Team Weitering went into the game without Luke Davies-Uniacke, Hudson Garoni and Max King, with most tipping Team Weitering to collect the win. Rayner showed his power in the forward half, using the ball well off either foot earning him the MCC President’s Award for the best player on the ground. The 187cm forward marks well overhead and can provide a marking target inside 50. Vic Metro teammates Jack Higgins (19 disposals, two goals) and Jaidyn Stephenson (15 disposals, three goals) were also impressive for Team Daniher. Higgins will be ruing his chances, hitting the post twice in the space of a minute but continued to show his tricks up forward. Stephenson played a role further up the ground than he has at TAC Cup level and will be one of the players in contention for the No.1 pick. Richmond father-son prospect Patrick Naish (son of Chris) continued his good start to the season, collecting 17 disposals playing across half back at times. Sam Walsh begun the day well for Team Daniher, finishing with 19 disposals in the midfield. Bottom-age tall Jack Lukosius showed his talents at both ends of the ground, booting a goal and assisting another. Jack Lukosius putting on a clinic early in the #U18Academy game. A goal & goal assist, could well be Top 10 in 2018s #AFLDraft. For Team Weitering, Jack Powell was a strong performer right throughout the day working his way up and down the ground. 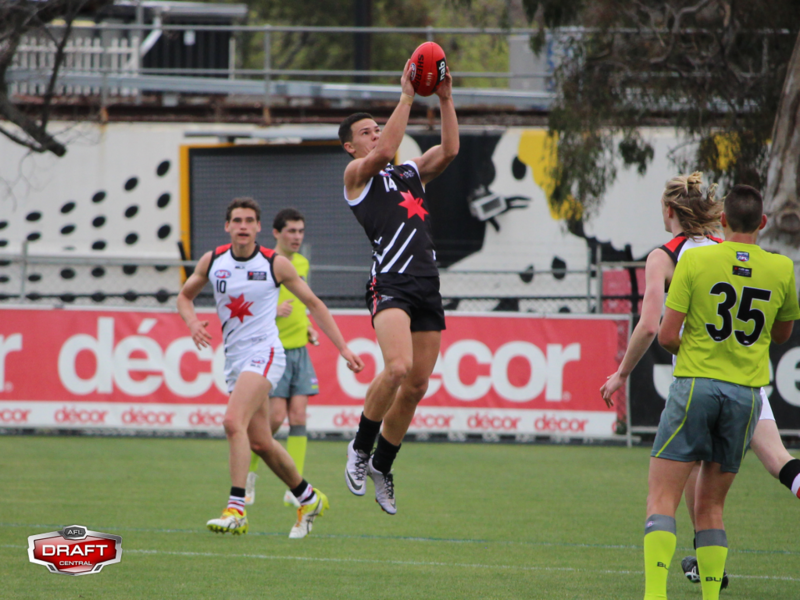 Powell is part of the GWS Giants academy and is eligible to be bid on at the end of the season. South Australian Darcy Fogarty kicked the opening goal of the day before moving down in defence in the second half, finishing off the game with a great last quarter. Midfielders Lochie O’Brien (19 disposals, one goal) and Charlie Spargo (19 disposals, five clearances) were strong right throughout the contest working hard in the centre. Gold Coast academy member Kwabye Boakye was impressive in defence and will be looking to continue that into next Saturday’s AFL Academy game against Northern Blues at Etihad Stadium.